First of all, thank you all for the very nice comments about my Chuck's socks! And then, the content of this entry. Last summer I got new bookcases. They are a bit smaller than the old ones, and I have pushed forward sorting out my books for a very long time. This Easter holiday I finally got around to do something about the piles of books I have that I no longer use. Some of the craft books are books I of different reasons have got doubles of, but most are books I have knitted one or two items from, and most likely will not use again. There are also some books by Tasha Tudor or illustrated by her that I have got doubles of. Due to the less space I have for my books now I have decided to try to find new loving homes for the books. The prices mentioned are all without the cost for mailing, the actual cost for mailing depends on where the book goes, and will be added to the cost of the book. - Knitted toys by Fiona McTague. Hardcover 2004. Condition slight wear on the dustjacket, otherwise as new,10 euro. - Knits for Barbie dolls, 75 fabulous fashions for knitting, by Nicky Epstein. Hardcover 2001. Condition slight wear on the dustjacket, oterwise as new, 10 euro. - Charmed knits, projects for fans of Harry Potter, by Alison Hansel. Paperback, 2007. Condition very good, 10 euro. - Miniature needlepoint carpets, by Janet Granger (dollhouse sized carpets). Paperback 1996. Condition very good, 10 euro. - Bloomsbury needlepoint, from the tapestries at Charleston farmhouse, by Melinda Coss. Hardcopver 1992. Condition very good, dustjacket shows slight wear, 10 euro. - The handmade soap book, by Melinda Coss. Hardcover, 1998. Condition very good, 10 euro. - Making your own teddy bear, by Peggy and Alan Bialosky and Robert Tynes. Paperback 1982. Condition wear on covers, otherwise in good condition, 5 euro. - Kauneimmat kanavatyöt, by Kaffe Fassett. Paperback 1993. Condition very good, 10 euro. - Vantar, mössor, sockor och sjalar, by Anita Gummerus. Hardcover, 2001. Condition very good, 10 euro. If you are interested, email me at mfast @ welho . com (omit the blank spaces), and ask for mailing prices and details about the books. As soon as a book is gone I'll take it off the list. Payment with PayPal or directly to my bank account. There will be some magazines on sale later on! Hello! No, I haven't dropped off the planet, I have just had my hands filled with a lot of other things. There has, as usual, been knitting going on, but my time by the computer has been used solely for none knitting purposes. This is the way the spring will continue, so I'll stop apologizing for not having time. I'll blog, but it won't be on a regular basis. Back in February, after finishing the friendship shawl, I started knitting on the Autumn Rose pullover by Eunny Jang. 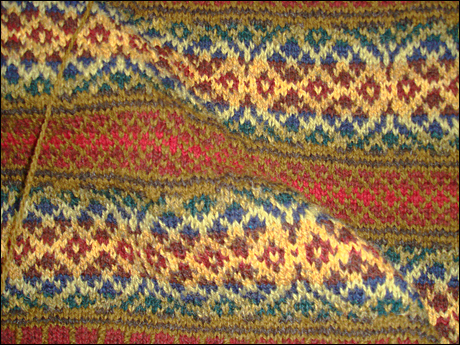 The pullover is knitted in Shetland wool, Shetland Spindrift by Jamieson's. The pattern is to be found in their book Simply Shetland 4: At Tomales Bay. I use needles in size 3 mm, and I'm knitting the smallest size. 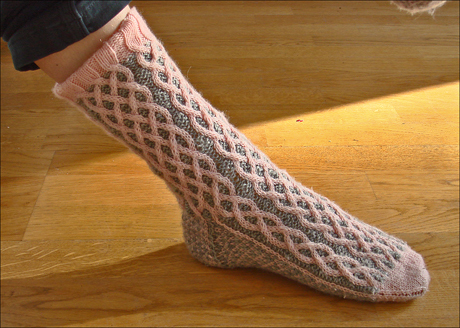 The pattern is much easier than Venezia, since it's more regular, and there for is this a very fast knit. I think I knitted the body in less than two weeks, and the first sleeve in about a week. And I haven't had that much knitting time, perhaps a little more than one hour every evening. I'll start the neck opening a bit higher than in the pattern, as those familiar with the pattern already can see from my picture. I have also decided to knit the sleeves longer than the pattern, a fact you can't see from the picture, since the sleeve there is the length the pattern states. I'll knit a new cuff and both pattern parts once more, take off the old cuff and graft the new beginning to the knitted sleeve. 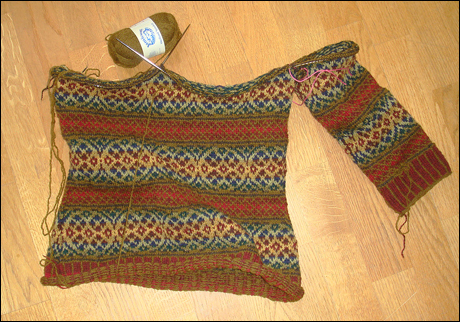 I'll have much more use for the pullover in my climate with long sleeves, and I do already have Venezia with 3/4 sleeves. The second sleeve will of course be knitted as a long one from the beginning. And here, a close up of the pattern. I love the colour combinations, this is simply beautiful pullover! P.S. 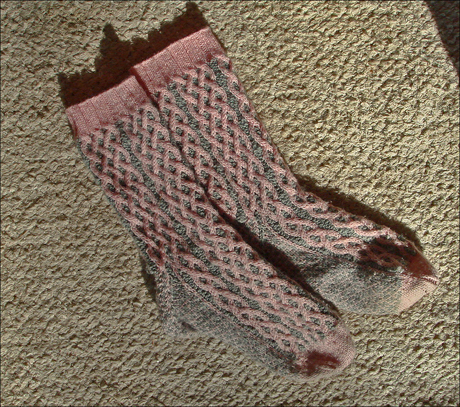 Chuck's cabled socks are finished, and have been waiting for a modeled socks picture session, but the weather has been grey and terrible, and I haven't got anything done. But there will be pictures!